Not possible to change video or control settings whilst playing a level. Even from SSD with high end machine games startup may take over half minutes excluding splash screens, Alt+Tab ↹ pauses loading completely. Launcher, only appears during first-time launch. Possibly FXAA as produces higly blurry image with High without AF. 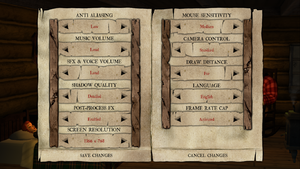 As option under "frame rate cap"
"Frame rate cap" caps game to 30 FPS, disabling the cap caps the game to 60 FPS. 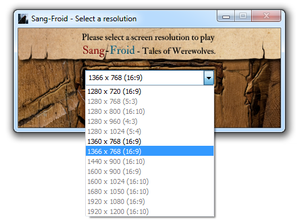 Enable vsync, it disables cap and correctly vsyncs game to monitors refresh rate. X-axis much more sensitive than Y-axis sensitivity. Music and SFX/Voice. Mute, Low, Medium and Loud. Splash screen will pause loading if alt-tabbed. 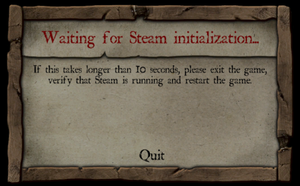 'Waiting for Steam initialization...' can take a long time and often requires restarting. ↑ 1.0 1.1 File/folder structure within this directory reflects the path(s) listed for Windows and/or Steam game data (use Wine regedit to access Windows registry paths). Games with Steam Cloud support may store data in ~/.steam/steam/userdata/<user-id>/227220/ in addition to or instead of this directory. The app ID (227220) may differ in some cases. Treat backslashes as forward slashes. See the glossary page for details.